We all love Stranger Things, the strange miasma of classic film references that assembled itself into a Netflix series. The show is an endless box of mysteries, from the reality of the Upside Down to 011’s origins. One fan theory thinks that the demogorgon (the faceless monster) is in fact a projection of Eleven’s consciousness. You’ll recall that when the boys race back to the house in the first episode they reach for comic books. 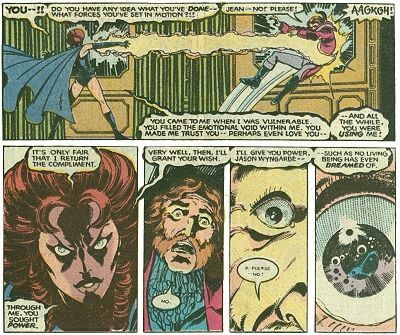 Notable among those comic books is X-Men #134, a comic notable for dark forces unintentionally unleashed by tapping into the consciousness of a psychic. Interesting. And you’ll definitely recall that Eleven says “I am the monster.” That’s in episode six, and it just seems like she’s enacting her guilt. But what if she meant things more literally? Like, that the demogorgon is a projection of the dark half of Elle’s subconscious? That would make sense, especially given that she was horrifically abused by Brenner and the rest of his thugs throughout the run-up to the show’s events. It would also explain why Elle seemingly melded with the demogorgon before they both disappeared.